Headaches and migraines can be caused by a wide variety of factors, including dehydration, improper nutrition, and skipping meals. When a headache occurs, most people simply take an aspirin and wait for the pill to take effect. Unfortunately, there are certain risks and potential side effects that come with taking aspirin. Every year, a small number of people actually die from taking aspirin. Consuming pills on a regular basis can also damage the lining of your stomach, leading to gastrointestinal issues and other health problems. To avoid the potential side effects, there are a number of natural ways to find headache relief—including drinking grape juice. How Can Concord Grapes Help Provide Headache Relief? Concord grapes are a great source of vitamin B2 (riboflavin), which can improve the function of your liver. Most migraines that are not related to sinus congestion are caused by abnormal liver function and this can be corrected by getting more vitamin B2. Grapes are also an excellent source of vitamin C and iron, both of which are beneficial for liver functions. When headaches occur that are related to sinus congestion, improper nutrition, or dehydration, drinking a tall glass of grape juice may be just what you need. this nutrient-densed juice helps to rehydrate your body while improving blood circulation. If you are prone to headaches drinking this juice regularly may help you to reduce headache recurrences. Due to their large seeds, they are not often eaten nor juiced raw. 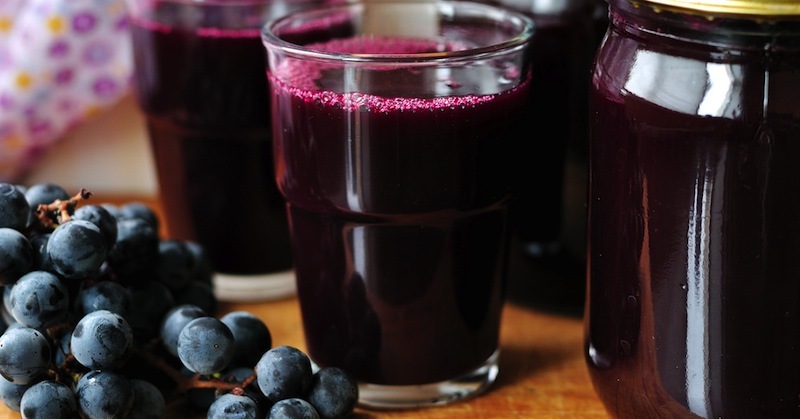 Here’s a recipe to make your own 100% homemade concord grape juice, that you can can and freeze for various uses, especially for relief of headaches. The first step is to wash the grapes and remove the stems. Next, combine the grapes and the water in a large saucepan. Heat over low heat. Simmer until the skins of the grapes soften. Use a potato masher to mash the grapes, while continuing to simmer for fifteen minutes. Occasionally stir the mashed grapes. Strain the mashed grapes through a sheet of cheesecloth. Discard the skin from the grapes. 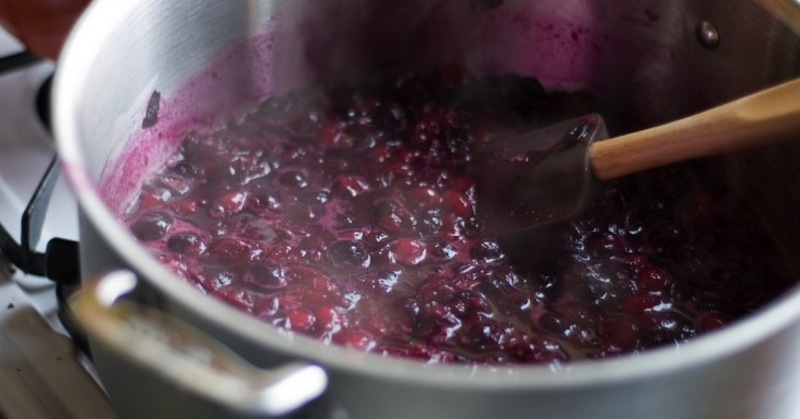 Place the strained grape jelly in a large container and put in your fridge. Allow the jelly to chill for 48 hours. As it chills, sediment will settle along the bottom. Prepare your mason jars by washing them clean. Use a water bath canner to arrange your jars. Add water and boil the jars for about ten minutes to sterilize them. Warm the lids in a small saucepan over low heat. It is important that you keep the jars and the lids warm until you are ready to can your grape juice. Remove the grape juice from the fridge, using caution to avoid disturbing the sediment that has settled. Carefully pour the grape juice through a strainer and into a large saucepan. Bring the juice to a boil. Continue boiling for ten minutes, stirring occasionally. Line your jars on your kitchen counter. You may want to place towels underneath, to avoid staining your counter. Carefully scoop the grape juice into the jars using the ladle. You should leave about a quarter-inch of space below the top of the jar. Using the magnetic lid lifter, remove the lids from the warm water, dry them and place on the jars. Screw on the bands and carefully place your jars into the canner. Once you have all the jars in the canner, add enough water to submerge the jars one-inch below the water level. Bring the water to a boil and continue boiling for five minutes. Let the jars sit for about ten minutes and then carefully remove them with a jar lifter. Place the jars on a towel and allow them to cool for twelve hours. After allowing the jars to cool, check the seal. Place your jars in the fridge. Once the grape juice has chilled, it is ready to drink. Try to consume your entire batch within a few days. This recipe takes a bit of time to prepare, but you can save money by preparing your own grape juice that is without preservatives. Along with saving money, you can also enjoy the fact that you have 100 percent, natural homemade grape juice that helps relieve headaches. When you notice the signs of a headache approaching, drink a glass of your homemade grape juice to stop the headache in its tracks.